In 2013, Nick Burbridge’s first solo collection of songs Gathered (also ably supported by the talented Tim Cotterell) earned him a Songwriter of the Year award from Spiral Earth and prompted me to write of “Nick’s most satisfying lyrical and musical ‘statement’ and (with due respect) the best album of this unnameable decade”. Four years later while remaining circumstantially marginalised, Burbridge has produced another “ job of work which demands our attention” and rendered my evaluation above obsolete. Like Dylan, Burbridge seamlessly combines the roles of poet and song and dance man such that the writing of songs is part of a larger endeavour to produce ‘work’. For Dylan this “tryin’ to be like the medium at a séance” while Nick writes that “As a writer in many other forms, I always work, initially, with visual imagery;” aiming to “allow some kind of landscape, city, or territory, to form in my mind”. Resolved is such a territory as Gathered was, a resistant material made manageable and malleable by our real time encounter with Burbridge and Cotterell’s ‘renditions’. Nick has written elsewhere that “The voice does not invest meaning; but it cannot fail to decipher it instinctively, and so is led where it must go; and, of course, this results in meaning being projected”. This is a complex work of art, like Burbridge’s forthcoming collection of poems Undercover Work, a fully realised and fully integrated exploration of where Burbridge is and has been. There are echoes throughout musically, thematically and lyrically of “a life spent avoiding the known good” (to use Alasdair Gray’s memorable phrase) but that more loosely, albeit memorably, ‘gathered’ is here decisively re-visited and extended and with ‘resolve’. 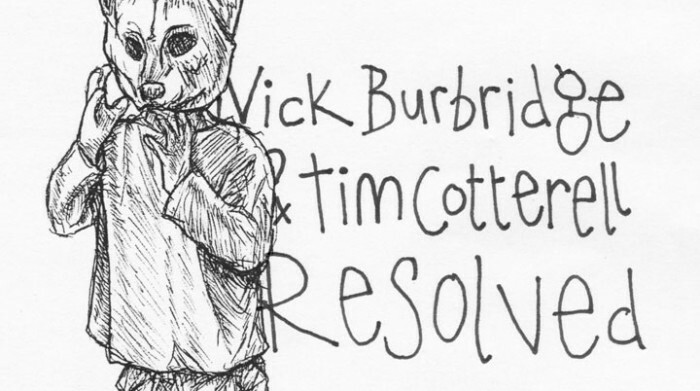 Resolved is powerfully and intricately structured as a series of functional narratives each assigned to a character though not character monologues: think Canterbury Tales rather than Talking Heads. They are, each of them, an aspect of Burbridge’s new-found resolve which embody trace elements of the long-term project and ventriloquize the human condition. They are held in place by the stark metrical discipline of half a dozen Tanka, short, syllable-based Japanese nature poems which provide the traction against which this multi-layered assembly can have purchase. Though they have a beauty of their own the Tanka are more importantly stripped-down manifestations of a Nature red in tooth and claw and thus Resolved opens with a vixen in labour at the very moment Burbridge births his latest ‘brood’. The unaccompanied verse lays down the challenge for all, artists and audience, at the moment of ‘issue’: “of the forms that she’ll conceive, now how many will survive?” It is appropriate that the momentary silence is broken by Nick’s words (and voice) half a beat before Tim’s accompaniment hot in pursuit and the first test of resolve is in a many ways the hardest: to find a fitting way to celebrate the life and contribution to the Folk idiom of Maggie Boyle. This is achieved magnificently with Another Song, the only item not attributed to a character function but the foundation for all of them in its patient defence of “a stream of song” that “gathers in a people’s history”. And all this is poignantly blended, with lyrical, melodic and thematic reminders of Burbridge’s ‘The Old Man’s Retreat’ which Maggie covered with such distinction in such a way that the sharing of “another song” promised by the chorus seems fully realised in the gyre of passion Nick and Tim create. It’s a miracle of perpetual motion that evokes Boyle’s “voice pitched clear and true” not as an end but rather a beginning since “at our embrace new form takes shape that will in turn break and escape from darkness into light where it belongs”. It’s a real fine place to start but also an incredible risk: leaping full-bodied and confident like Hamlet into Ophelia’s grave, hoping that this open, personal leap of faith will illuminate or at least energise the contributions of Outcasts and Seekers, Seafarers and Quakers that follow. The rest is classically undercover work performed ironically at stages after the ‘principal’ has been identified, “to our gaze unsealed”. This offers us a twin perspective in which all characters participate in their own narratives while at the same time functioning as embodiments of Nick’s sometimes troubled psyche (they are out, as ever, on “the streets of the heart” though ‘faith’ and ‘reason’ are also landscapes here). There is a terrific range here exemplified by the first set of explorations: the Outcast’s witty reflections on (im)mortality, the Pacifist’s jaunty resistance and the Survivor’s troubling intensity. Nick Burbridge brings a literary sensibility to the established textures of traditional music in a way that means both are enhanced: it’s just so rare to get this density and subtlety of lyrical content anywhere. While the forms and structures are well-established, the influences are writerly and the usual suspects: Beckett, Yeats, Rimbaud and, especially, Eliot. This is not about cleverness but rather about texture, community and purpose. Resolved is Burbridge’s Waste Land, an album of landscapes to be traversed, a spiritual journey through everywhere and nowhere and the monumental Song of a Seafarer is its focal point. It’s all here for any who turn the wheel and look to windward with Burbridge combining the roles of Phlebas and Tiresias (sailor and seer). The “deep tide that runs in the blood” like “salt in my eyes again” play out beyond the sea that has no ‘front’. Though this is “no mythology”, it is deeply methodological, suggesting that it’s “all in the shantih you sing” and that ”you just need the right quay” with a look at the printed lyrics confirming the broader reach (Shantih is the Sanskrit blessing that concludes Eliot’s poem). These songs are all quays of sorts, places to engage and take rest. The Seafarer is for any of us who have travelled too far in ‘coracles’ fashioned from “tanned leather and tar”. Here is everything: politics, history, literature, art and (Nick’s speciality) ‘unaccommodated man’! The music too, as everywhere, is precise and evocative as Resolved gets into its stride. The Seeker offers light relief but continued relevance and resonance for though the world still pursues, “you’ll not catch this hare”. Then all the elements gather together in the exquisite Song of an Old Quaker, a deeply compassionate and mature exploration of reason and faith. Here, the healing fountains start and resolve starts to feel a little like resolution in this sumptuous union of generosity and forgiveness: “So may you live well”. Living well is also obliquely the theme of the Partisan’s contribution though tempered by Time’s vagaries or “what needs to happen when the hard rains fall”. This is monumental, atmospheric and thrilling, heroism unmediated by militarism or bravado: “not a tale of soldiering or all the venom struggles bring”. In fact the protagonist is a farmer, a thinker and a family man living a life that he would in better times been able to “one day with pride recall”. Instead “all he seeks is here and now” as his village is invaded, his family conveyed to exile and the song tells “how one man fought alone and that is all”. It is measured and mature and against the rising, finally almost deafening accompaniment incredibly poignant. Those who have tracked the songwriter’s various struggles with overbearing ‘darkness’ might feel an extra edge here but will also appreciate, nay relish, the joyful resilience of the last two numbers. Firstly a revisiting of one of my favourite Burbridge songs ‘Song of a Father’, newly repositioned and updated as ‘Song of a Daughter’. And in this shift of perspective there is again a more settled appreciation of all we are, “sweet though in sadness”: less sorrow and more understanding. And though the final Tanka asks bitterly “what spoils remain in the land?”, Nick now has an answer, in fact an album’s worth, a collection of songs as strong as any that will be ‘released’ this year in any idiom. And though Song of a Celebrant is perhaps not the strongest of them, any that have followed Nick’s career(ing) will appreciate its ebullience and cheerful defiance, “havoc at work on the streets of the heart”! And hope fervently that the absence of “an enemy within” will further fuel this great period of creative productivity so that his final benediction might be realised: “if we are released my heart let years of peace begin”. Likewise Eliot: “Shantih, shantih, shantih”.